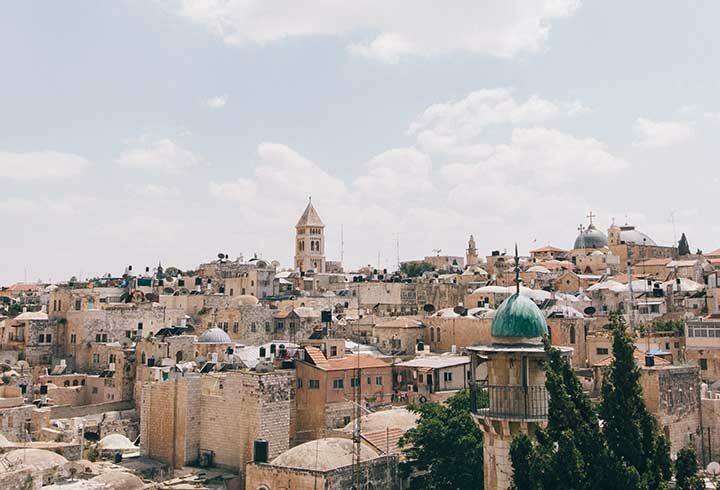 Led by Aryeh Maidenbaum, our trip will begin in Jerusalem—where ancient history mingles with modern-day life and stirs our emotions like no other place on earth. From Jerusalem, we will head south to Mitzpe Ramon—Israel’s Grand Canyon, a spectacular site where thousands of birds migrating from Europe to Africa stop to rest each year and where we will pause and enjoy our stay at Beresheet, a world-class hotel and spa situated high above the makhtesh (canyon). En route, we will visit Avdat (a UNESCO World Heritage Site), built by the Nabataeans in the second century CE and seldom seen by most visitors to Israel, and the Ben-Gurion gravesite and museum at Kibbutz Sde Boker. From Mitzpe Ramon, we will drive to Eilat and cross the border into Jordan, where we will spend two nights in the ancient “rose red” city of Petra, which was carved out of solid rock and is surrounded by soaring temples and elaborate royal tombs. Before returning to Tel Aviv, we will stop at Mount Nebo, where Moses is said to have been shown the Promised Land (which he would not reach), as well as Jerash, one of the best-preserved Roman towns and hidden to the world for centuries. 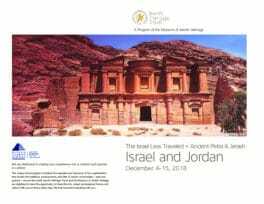 Join us on this extraordinary program—one that will be meaningful and exciting for return travelers as well as those who are visiting Israel for the first time—and experience an Israel that most visitors never get to see. Check in to the 5 star Inbal Hotel. Superbly located, and recently renovated, it is within walking distance of the Old City and remains one of finest hotels in Jerusalem. Afternoon free to rest and relax. Evening presentation by Iddo Katz, “Archaeology of Ancient Israel,” followed by Introductions and an opportunity to get to know one another. Opening Dinner at the Inbal (included). Depart Inbal for walking tour of the Old City of Jerusalem. During the course of our day, some of the sites we will visit include the recent excavations at the City of David; the Kotel (Western Wall) and nearby Davidson Center; the rebuilt Jewish Quarter, and the Wohl Museum of Archaeology. Lunch on our own with time free to explore, shop and enjoy the atmosphere of the Old City. Visit Yad Vashem Memorial and Holocaust Museum—the world’s leading museum, archive and research center of the Holocaust. 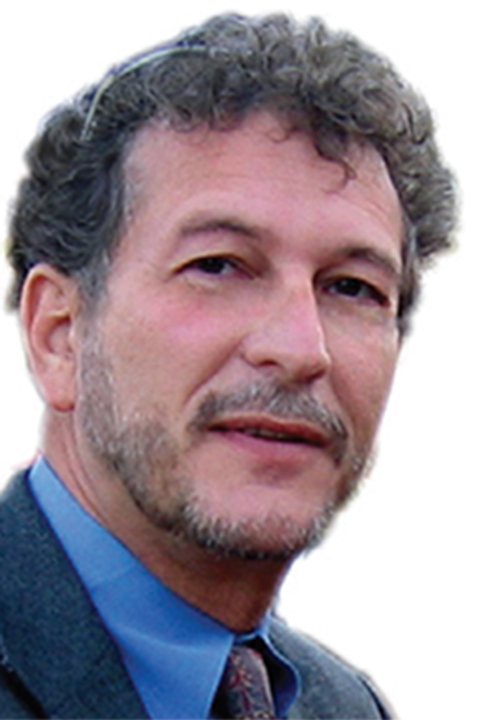 At Yad Vashem, we will be greeted by one of the Museum’s curators who, through lecture and discussion, will bring us up to date on current research in Holocaust studies and education. Lunch on our own at Yad Vashem cafeteria, followed by visit to nearby National Mt. Herzl—“Arlington of Israel” and site of memorials to important figures in Israel’s history, including Theodore Herzl, Golda Meir and Yitzchak Rabin among others. Morning: visit to the Israel Museum—the largest Museum in Israel and ranked among the world’s leading art and archaeology museums. Our morning at the Israel Museum will begin with a special welcome and talk by one of the Museum’s curators. During the course of our time at the Museum, we will enjoy a special, private guided tour. Following our tour of the Museum, time for shopping at the Museum’s tasteful gift shop before returning to our hotel for lunch on our own OR (optional) visit to the bustling Shuk of Mahne Yehuda for lunch on our own and time to wander about. Evening: (optional) attend Shabbat evening Services at a nearby Synagogue, followed by dinner (included) at our hotel. Free day to rest, relax, attend Services, and/or explore Jerusalem on our own. Evening: meeting and discussion with a leading political or cultural figure, followed by dinner on our own. Depart Jerusalem for Mitzpe Ramon. En route, stop at Kibbutz Sde Boker for visit and tour of Ben Gurion’s gravesite, home (whose rooms are exactly as Ben Gurion lived in them during his last years) and museum. Ben Gurion and his wife Paula’s gravesites overlook the magnificent Zin Valley and are visited by tens of thousands each year. From Sde Boker, we will continue to the impressive, nearby archaeological site of Avdat-now a UNESCO World Heritage site. A major city built by the Nabataeans in the 2nd Century CE, its many partially reconstructed temples and structures offer dramatic views of the desert. Lunch along the way (included). Check in to luxurious five star Beresheet Spa in time for relaxation and dinner (included). 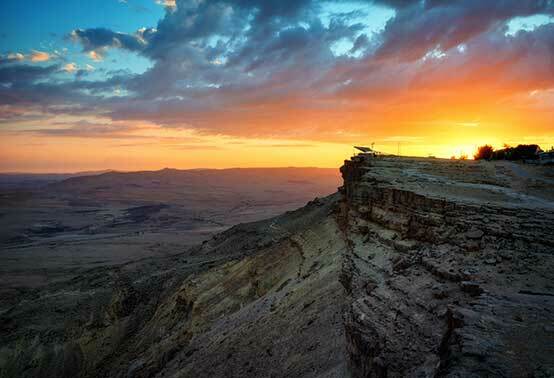 Morning: visit the inspiring Mitzpe Ramon visitor center- housed overlooking Makhtesh Ramon- Israel’s Grand Canyon; it is named and dedicated in honor of Ilan Ramon, the Israeli astronaut who perished aboard the Columbia space shuttle. A spectacular crater, with wildlife and vegetation unique to the desert, where thousands of migrating birds stop to rest each winter en route from Europe to Africa, Mitzpe Ramon is a site not to be missed if one wants to appreciate the spectacular landscape of Israel. Rest of the day free to enjoy the facilities of Beresheet spa…OR..(Optional) partake in an afternoon exploring the Makhtesh in the company of a licensed guide. Overnight and dinner (included) at Beresheet. Depart Mitzpe Ramon for the “Rose Red” Nabataean city of Petra, crossing the border at Eilat. Lunch along the way (Included) before our late afternoon check in to the five star Mövenpick Resort Hotel—located directly at the entrance to the historic Nabataean city of Petra, in time for dinner (included). Walk just across the road for a visit and tour of the spectacular archaeological site of Petra – carved out of solid rock, surrounded by soaring temples and elaborate Royal Tombs, and lost to the world until just over 125 years ago. The capital city of the Nabataeans, established sometime during the 4th century CE, this ancient city is famous for its red rock architecture and highly advanced system of water irrigation- centuries ahead of its time. Lunch on our own during the course of the day. Overnight and dinner (included), at our hotel. Depart Petra for return to Israel- stopping en route at Madaba, whose Byzantine churches contain elaborate mosaic floors (including the famous map of the ancient world); historic Mount Nebo- from where Moses viewed the Promised Land, which he himself would not enter, and historic and ancient site of Jerash before crossing the border and continuing on to Tel Aviv. Lunch in Madaba (included). After arriving in Tel Aviv, check in to the five star, stylish Sheraton Hotel – overlooking the Mediterranean and just minutes away from Old Jaffa. Late morning visit to the newly renovated Bet Hatfutsot- Museum of the Diaspora- whose fascinating exhibits tell the story of the Jewish people from over 80 countries, over a period of thousands of years. Here, we will be greeted by one of the Museum’s Curators, enjoy a private tour, and hear a talk by a scholar on an aspect of Jewish history and culture. Evening: Shabbat dinner (included) at our hotel. Free Day to rest, relax from our journey, and/or explore Tel Aviv or Old Jaffa on our own. Late checkout before departing for Ben Gurion airport for flights returning to the U.S. – OR, for those who prefer, the option of staying on in Israel at an additional cost. Jerusalem: The Inbal Jerusalem Hotel, is an elegant, modern five-star deluxe hotel located close to both the Old City and modern downtown. 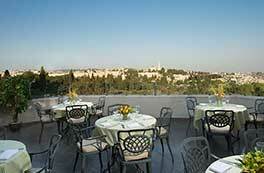 Its rooms are beautifully furnished and feature terraces overlooking western Jerusalem or the Old City. The Inbal’s swimming pool, health club and sauna will provide a welcome respite from the day’s activities. 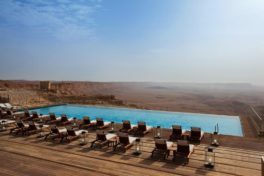 Mitzpe Ramon: The Beresheet Hotel is located amid a breathtakingly beautiful primeval landscape, near the ancient Spice Route, on the edge of the towering cliffs that slope down into the Ramon Crater – an extraordinary natural phenomenon unparalleled in the world. This exceptional desert hotel, which maintains a dialogue with the surrounding desert, allowing its essence to penetrate every corner, excels in its attention to even the smallest detail, as well as its emphasis on conscientious and uncompromising personal service. 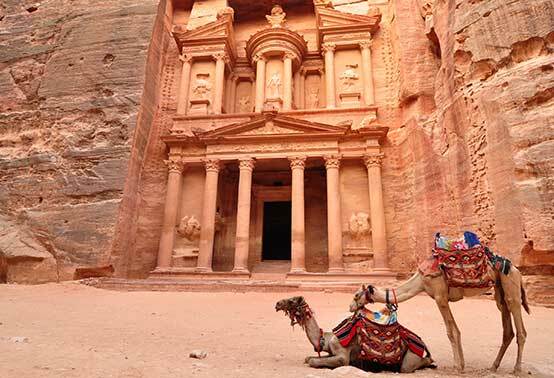 Petra: The Mövenpick Resort Petra is located directly at the entrance to the historic Jordanian city of Petra. This resort with an oriental flair features an exciting combination of natural stone, handcrafted wood and Middle Eastern fabrics and textures. Magnificent views and glorious sunsets can be enjoyed from the lush Al Ghadeer Roof Garden. The hotel’s award-winning restaurant is renowned for its lavishly prepared dinners as well as Mediterranean culinary delights. 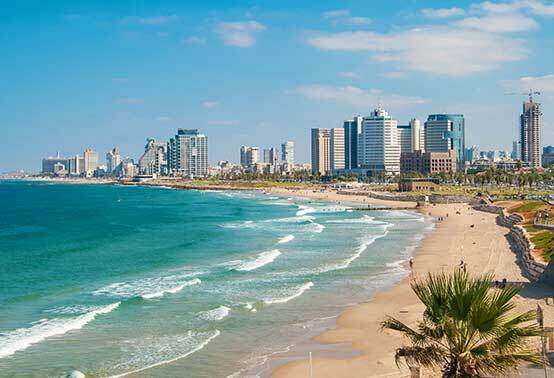 Tel Aviv: The Sheraton Hotel, one of the most desirable hotels in Tel Aviv, is superbly situated on the shore of the Mediterranean Sea- in the heart of Tel Aviv. The five star deluxe Sheraton, a short distance from Old Jaffa, provides clear, breathtaking views of the white sands and sea. PLEASE NOTE: This trip is no longer open for online registration. To inquire please contact the office at 845.256.0197, Monday-Friday, 10am-5pm or by email anytime.